Nearly 45% of all hair fall cases stem from an unhealthy diet. You need to consume proteins to re-grow hair and prevent hair fall. Include plenty of fish, eggs, chicken and nuts in your diet. If you are vegan or vegetarian, go for soy, nuts, beans and lentils. Also eat a balanced diet comprising of fruits, , low fat dairy, vegetables, nuts and seeds. Choose whole grains instead of refined grains. Limit your intake of alcohol, nicotine, sugary foods and beverages as well as deep fried foods. Consume foods that are as close to their natural, raw state as possible. Tip: Foods great for hair include walnuts, flaxseeds, fatty fish, lean meat, soy, colorful fruits and berries and whole grains. Drink copious amounts of water to eliminate toxins that are responsible for hair fall. Often, our diet is inadequate and cannot provide us with minerals or vitamins that are needed for strong and healthy hair. So talk to your doctor about supplementing with a multi-vitamin/mineral pill. Vitamins for hair growth include: zinc, biotin and other B vitamins, vitamin C, D and E as well as iron, calcium and trace minerals like copper, selenium and so on. Many hair styles and styling treatments can cause unnecessary stress on the hair leading to hair fall and breakage. Try to stay away from these. If you are using heat treatments, make sure you use protective products that can prevent damage to the hair shaft. Tip: Protect your hair from excess sun exposure too. Cover up when going out. Also avoid braiding, weaving, or cornrowing your hair tightly. Once a week, deep condition your hair at night using oils like olive oil, coconut oil, jojoba oil or sweet almond oil. Add a few drops of essential oils to these carrier oils. Carriers oils quickly take the nutrients to the roots of your hair while essential oils provide nutrients that target specific hair problems. For example, tea tree essential oil can be used to prevent dandruff, rosemary essential oil can be used to prevent fungal infections of the scalp, chamomile oil can be applied to relax the body and mind and curb stress to prevent hair fall. Tip: Massage the roots and scalp well with the oils described above to increase blood flow to the roots. Wash off with a mild shampoo the next morning. Green tea is packed with catechins and bio-flavonoids. These inhibit dihydrotestosterone or DHT which is one of the main androgens that lead to hair fall. Tip: Drink at least 2-3 cups of green tea daily to prevent hair fall and detoxify the body. Minoxidil or Rogaine is one of the only topical drugs available in the market to curb hair fall in men and women. Minoxidil is available over the counter. Apply it daily to balding areas. In the beginning, you might feel the drug is not showing results and may even notice an increase in hair fall. However, you must persist. Most patients have experienced luxurious new hair growth with Minoxidil within 6 months of daily used. The vasodilator medicine in Minoxidil works on the hair follicles to curb DHT production. Finasteride is one of the best oral medicines for curbing hair fall in males and females. It is sold under the brand name Propecia and blocks the DHT that causes hair fall. Talk to your doctor whether this anti-hair fall drug is right for you. In some men, finasteride is known to cause side effects such as reduced libido. Women who are pregnant or plan on getting pregnant must not use Finasteride. 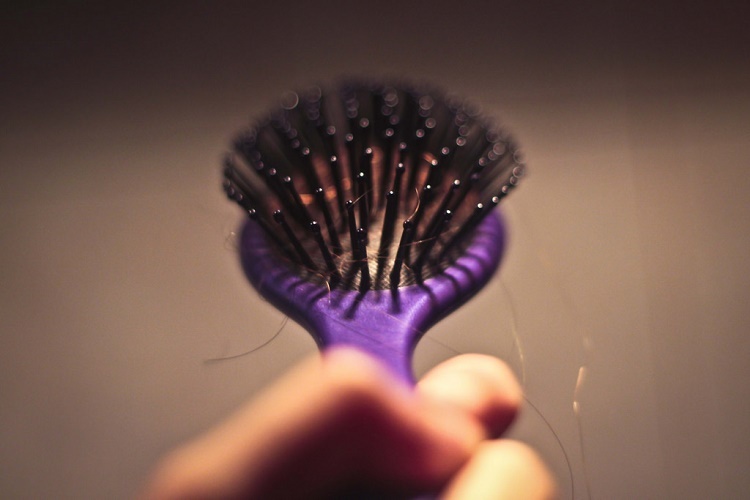 Environmental toxins and pollutants as well as product build up can all lead to hair fall. So, once a week, use a scalp cleansing remedy as follows: Add a tablespoon of apple cider vinegar to warm water and use it as a final rinse after washing the hair. Do not towel dry the hair-allow it air dry naturally. Apple cider vinegar not only cleanses hair and scalp, it also strengthens the hair, prevents dandruff and gives a natural shine to the hair. Check out product labels before buying shampoos, conditioners, gels, mousses or hair colors. Avoid coloring the hair before 7-9 weeks. Avoid shampoos with parabens, sulfates and other hair-fall inducing chemicals. Many drugs can lead to hair fall. Talk to your doctor and change the prescription or dosage in such a case. On an average, a person loses up to 50-100 hairs per day. If you are unhappy with the amount of hair you are seeing on your pillow or in the sink, talk to a dermatologist to help you out. If you are up for it, you can even go in for invasive hair rejuvenation treatments like laser therapy, plasma or stem cell scalp injections as well as hair transplant procedures that are known to regrow hair immediately.